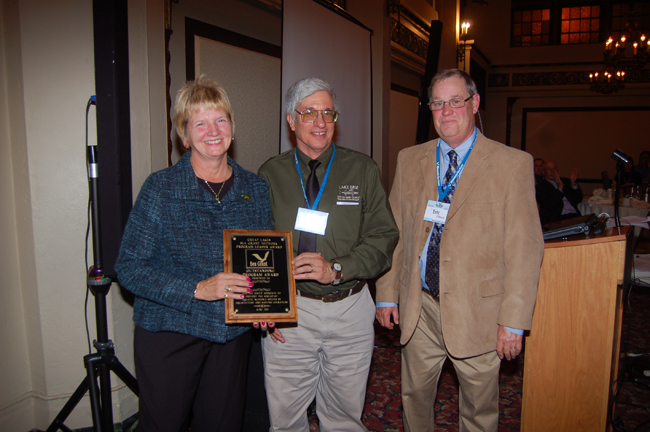 In October 2012, two of New York Sea Grant's (NYSG) own were honored for excellence by the Great Lakes Sea Grant Extension Network. The acknowledged efforts of Helen Domske, Buffalo, and Dave MacNeill, Oswego would add to that of a handful of other NYSG specialists who received their own recognitions within the year. “These well-deserved awards recognize the excellence of the programming developed by New York Sea Grant Extension educators throughout New York State," said NYSG Associate Director and Cornell Cooperative Extension Assistant Director Katherine E. Bunting-Howarth. "The public reaps the benefits of their work to educate communities about what we can all do to help maintain the vitality and environmental quality of New York’s Great Lakes and marine coastal ecosystems." Helen Domske, NYSG's Coastal Education Specialist, received an Outstanding Outreach Award for her public education programming related to the “Dose of Reality” campaign on the proper disposal of pharmaceuticals and personal care products to prevent the release of toxins into the Great Lakes. A survey by Domske’s Great Lakes Ecology students at the University of Buffalo indicated that a majority of their family and friends lacked awareness about proper disposal techniques. In response, Domske (pictured below [left], receiving her award from Ohio Sea Grant Extension Specialist Frank Lichtkoppler [center], and Pennsylvania Sea Grant [PASG] Extension Director Eric Obert) authored “Undo the Environmental Chemical Brew: Keep Unwanted Medications & Chemicals Out of the Great Lakes,” a publication co-produced by New York, Illinois-Indiana, Ohio and Pennsylvania Sea Grant programs with funding through the E.P.A. Great Lakes Restoration Initiative. The four-page primer covers the impact of such substances as antibiotics, antidepressants, birth control pills, cosmetics, and even vitamins on the freshwater Great Lakes system that supplies drinking water to 42 million people in the U.S. and Canada. 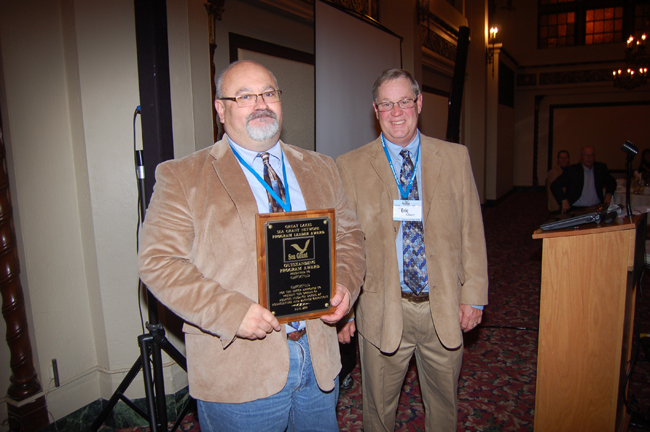 NYSG Fisheries Specialist Dave MacNeill (pictured below, at left, with PASG's Obert) received the 2012 Superior Outreach Award for his work to improve the design and use of trawls as a fisheries management tool in the Great Lakes. Supported by the 2011 Lake Ontario Great Lakes Regional Research Information Network (GLRRIN) Project, MacNeill’s 2011 workshop for managers of the $5 billion-valued U.S. and Canadian Great Lakes fisheries resulted in efficiency modifications to three new Great Lakes trawling vessels and led to an improved understanding of the dynamics of prey fish capture by bottom trawls in the Great Lakes. Additionally, a representative of the Czech Academy of Sciences’ Institute of Hydrobiology Fish Ecology Unit applied lessons learned at MacNeill’s 2008 trawl workshop, sponsored by Rhode Island Sea Grant, to the development of a new trawling research vessel now at work in the Czech Republic monitoring water quality in public drinking water reservoirs. Earlier in 2012, four New York Sea Grant marine coastal issue extension educators received awards for their work. 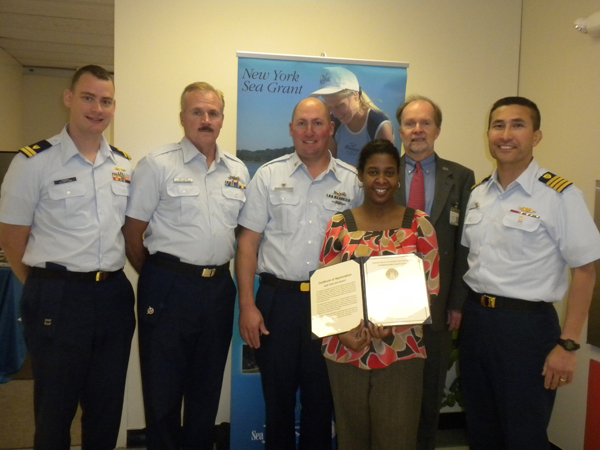 The U.S. Coast Guard and the Northeast Sea Grant Consortium recognized NYSG Marine Fisheries Specialist Antoinette Clemetson (Riverhead), for her 2010-11 Safety-At-Sea training programs for commercial fishing fleets. From left to right: Lt. Christian J. Barger, USCG Marine Safety Detachment Supervisor, Coram; Capt. Bill Nelson, Coast Guard Auxiliary; Officer in Training BMCS Jason Walter, USCG Station Montauk; Antoinette Clemetson, NYSG Fisheries Specialist; Dr. Jim Ammerman, NYSG Director; and Captain Joseph M. Vojvodich, USCG regional commander for Sector Long Island Sound. 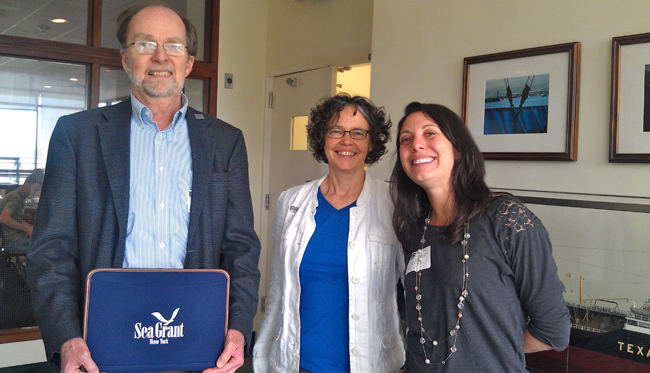 The Mid-Atlantic Sea Grant Extension Network recognized Stony Brook-based NYSG Seafood Specialist Ken Gall (pictured below with NYSG's Associate Director Katherine Bunting-Howarth) and Delaware Sea Grant’s Doris Hicks. The duo received an Excellence in Outreach Award for work leading up to the creation of www.seafoodhealthfacts.org, a Web site aimed at helping consumers weigh the benefits against possible risks of eating seafood. NYSG Hudson Estuary Specialist Nordica Holochuck (Kingston) received the 2012 Science Council of New York City Resnick Memorial Presidential Award for her work with the New York State Marine Education Association (NYSMEA) that provides teachers with innovative lesson plans and professional development credits. Holochuck chairs NYSMEA’s education committee. 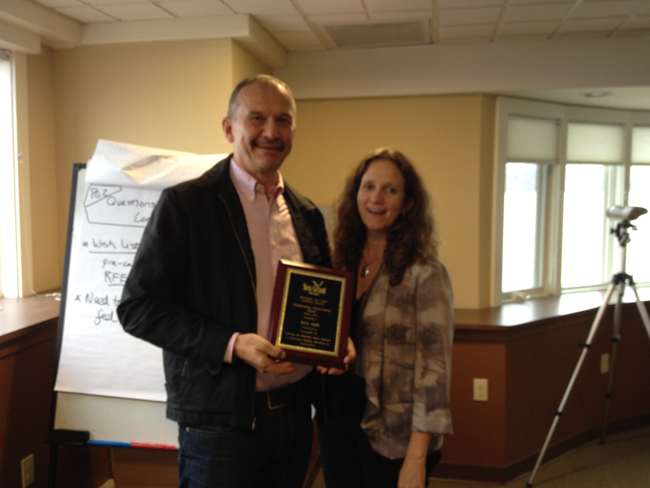 NYSG's former Long Island Sound Study Outreach Coordinator Larissa Graham (Stony Brook) was awarded NYSMEA’s Kinghan Service Award, presented to a NYSMEA member with at least three years of outstanding participation meeting the needs of the organization. Graham is a former chair of NYSMEA’s Web site committee, a former Executive Committee member, and co-organized and led two restoration trips to the Louisiana coast to teach NY educators about habitat loss in NY. NYSG Director James Ammerman (far left) with (l-r) Nordica Holochuck, NYSG's Hudson Estuary Specialist, and Larissa Graham, NYSG's former Long Island Sound Study Outreach Coordinator, at NYSMEA’s annual conference at SUNY Maritime, June 2012. Photo credit: Sara Richards, Board Member, New York State Marine Education Association.